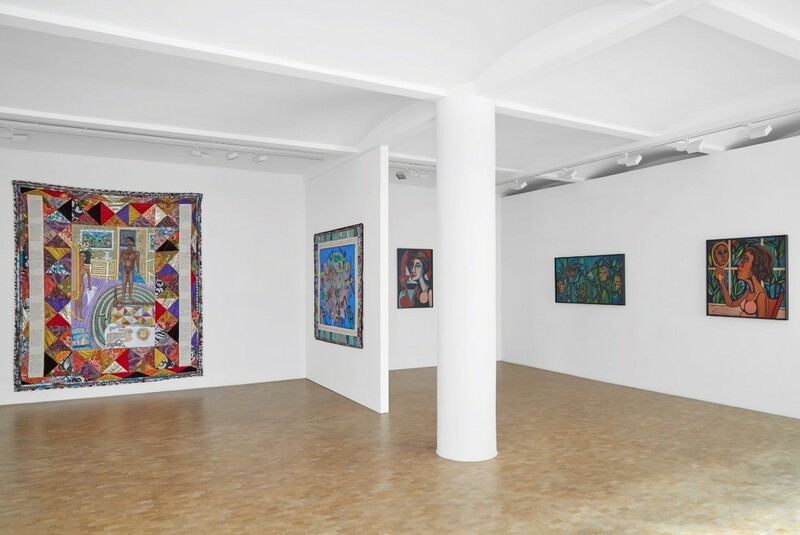 The Pippy Houldsworth Gallery in London recently presented the first European solo exhibition devoted to the art of Faith Ringgold. The exhibition, Faith Ringgold: Paintings and Story Quilts, 1964–2017, afforded viewers a unique opportunity to appraise the artistic development and contemporary relevance of one of the preeminent figures in American art today and featured a selection of early paintings from the artist’s American People Series and story quilts dating from the 1980s to 2017 (fig.1). Long recognized in the United States, Ms. Ringgold’s work has now come to the wider attention of audiences in the United Kingdom and Europe as well. The Houldsworth exhibition allowed visitors to trace elements of continuity—most obviously, the artist’s enduring commitment to the human figure as a vehicle for artistic and political expression. It also allowed them to perceive the changes as well, with the introduction of new subjects, mediums, and techniques over the span of her career by juxtaposing three of Ringgold’s American People canvases from the 1960s with seven of her more recent story quilts. The intimate but uncrowded spaces of the gallery encouraged close interaction with the objects on view, while its “white cube” design provided a suitably neutral background for both the brilliant color and minute detail of the quilts and the darker colors and broader forms of the paintings (fig.1). The generous spacing of objects accommodated the large scale of the quilts, while natural light flooding the interior space further enhanced the visibility and immediacy of the works on display. Ringgold described her American People Series, executed from 1963 to 1967, as “intended to make . . . a statement about the civil rights movement and what was happening to black people at that time, and to make it super-real.”1 To fulfill this ambition, the artist turned to serial imagery. Recalling its use by artists such as Jacob Lawrence and Romare Bearden, American People adopts this format to convey the varied forms and faces of racism and the illusory nature of the American Dream. While the unequivocal sociopolitical messages and searing imagery of the final American People images, DIE and The Flag is Bleeding (both 1967), attest to their relevance to present-day America, other canvases in this series explore “what was happening to black people” in a more private, intimate manner. A case in point is American People Series #16: Woman Looking in a Mirror (1966; fig. 2). Featured in the Houldsworth exhibition, it portrays a black woman gazing pensively at her reflection in a mirror. Set against a background of lush foliage, the relationship between face and reflected image is problematic—is the reflection her own, that of another woman, or an imagined likeness? It suggests the complex, multifaceted nature of her identity. Referencing a long visual history of women and mirrors in Western art, Ringgold challenges its exclusions and conventionalized standards of beauty by inserting a black body within it. Presented here as an object of self-reflection rather than vanitas, Ringgold’s mirror corrects the raced and gendered gaze too often directed at women of color as it asserts the subjectivity of the black female protagonist. The flat, heavily outlined forms and areas of bold, unmodulated color of the painting assert the artist’s realization of a black aesthetic that unites formal innovation with political content, recalling African masks and sculpture as well as Pablo Picasso’s appropriations of these objects. 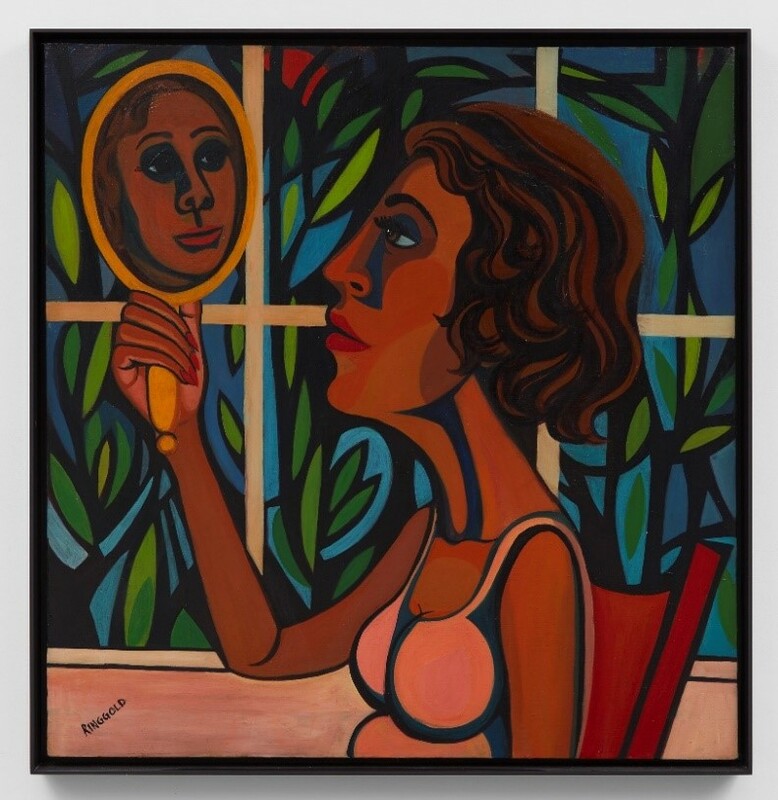 Ringgold observes her own artistic development, noting how “instead of looking to Greece, I looked to Africa.”2 As seen extensively within her oeuvre, Woman Looking in a Mirror reiterates the importance of what she found there. She has also looked to the stylistic innovations of Cubism, citing Picasso as a major influence throughout her career. While evoking the abstracted forms, psychological probing, and art-historical references of his Girl before a Mirror (1932; Museum of Modern Art), Ringgold’s Woman Looking in a Mirror filters these elements through the lens of black female experience and empowerment.3 Initially trained to emulate “the masters of modern art” such as Picasso and Henri Matisse, Ringgold explains that “those artists were in me, and I had to get that out. I found my own way, and now I can use them or not use them. I consider their influence positive, and I accept them.”4 Her acceptance, however, is clearly on her own terms. Picasso’s influence is equally evident in Ringgold’s American People Series #20: DIE. Painted in 1967 in part as a response to Guernica (1937; Museo Nacional Centro de Arte, Reina Sofía, Madrid), this canvas was featured in the Tate Modern exhibition Soul of a Nation: Art in the Age of Black Power that debuted in London in the summer of 2017.5 The exhibition showcases African American art produced between 1963 and 1983 and examines a range of responses to the cultural and political upheaval of those decades. In London, DIE occupied a prominent place in the section of the exhibition addressing the theme of Figuring Black Power. Picturing the frenzied chaos of a race riot, its visual power, visceral effects, and contemporary relevance generated considerable interest on the part of both audiences and critics. Opening soon after Soul of a Nation closed in London, the Houldsworth Paintings and Story Quilts solo exhibition complemented and expanded upon her earlier presence in the Tate Modern group show. Together, these displays of Ringgold’s work reiterated her lifelong commitment to social justice and to the role of the arts in this struggle. In a career spanning more than fifty years, Ms. Ringgold has continued to protest racist and sexist practices in the art world and the particular limitations imposed on female artists of color. Now eighty-eight, she is renowned not only as an artist but as an educator, activist, and author of award-winning children’s books. Ringgold’s mixed-media story quilts continue to emphasize figurative representation as a means of expressing sociopolitical concerns, yet their materials, narrative content, and formal strategies depart markedly from those of her earlier paintings. In the 1980s, she began to incorporate written narrative into her quilts, which expand upon a tradition practiced by generations of African American women, including those in her own family. The domestic associations of these objects indicate Ringgold’s shift toward forms of empowerment based in (but not limited to) personal, feminine, and familial spheres. The artist’s working partnership with her mother, a professional dressmaker and designer, reiterate her commitment to the ethos of female collaboration at the heart of the quilt-making tradition. Initially produced as single works, the story quilts soon evolved into extended series. 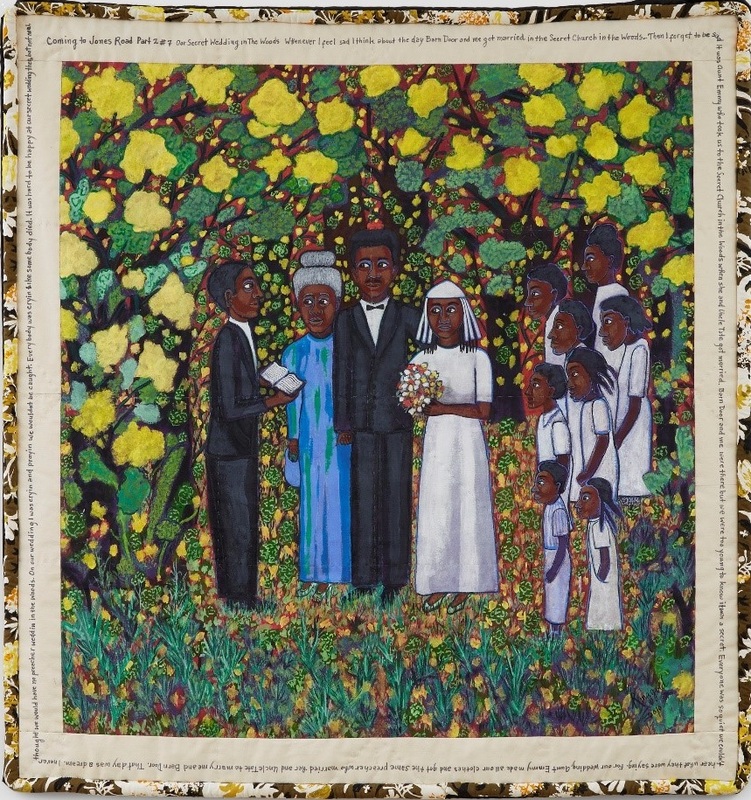 The Houldsworth exhibition features two story quilts from the Coming to Jones Road Part II series (2010), which follows the imagined journey of a couple fleeing slavery on the Underground Railroad.6 The seventh “chapter” in this narrative, Our Secret Wedding in the Woods, depicts a particularly poignant moment in this journey, the wedding of the escaped slaves (fig. 3). Although they are surrounded by family, friends, and a lush canopy of spring foliage, the wary facial expressions and tense body language of the bride and groom betray the sense of anxiety underlying this otherwise joyous scene. Framing the painted figures in the central panel, the handwritten text in the border of the quilt confirms this tension. Narrated by the bride, Precious, it tells how on her wedding day, she was “cryin’ and prayin’ we wouldn’t be caught . . . it was hard to be happy at our secret wedding then.” In words and images, Our Secret Wedding contrasts the protective, welcoming world of nature with the harsh realities of human prejudice and injustice. As conceived by Ringgold, the multigenerational family in Secret Wedding narrates a history of slavery in America. They embody both the unifying bonds of love and the constant fear of separation, bearing witness to the institutionalized racism that denied slave marriages legal protection while sanctioning the routine separation of mothers, children, and families. Their struggle intersects with that of the artist and her own family: both of her great-grandmothers were born into slavery, and the title of the series, Coming to Jones Road, refers to the “unfounded animosity” Ringgold encountered upon moving to suburban New Jersey from New York City.7 In this way, the stories of her subjects become a conduit for her forceful intervention into events past and present. Focusing attention on “the great blind spots” of Western culture, Ringgold shows how they pertain equally to race and gender. In her reimagining of history, all of her story quilts are narrated by women, and all of their stories are written by Ringgold. Like the quilting medium itself, they assert her “freedom to say what she pleases” and, as a black female artist, her power of self-representation. The sociopolitical content of the story quilts may be initially less obvious than that of earlier paintings; however, it is no less potent. In these objects, her use of collage, mixed media, and “craft” techniques is intrinsic to the visual vocabulary and formal structure of the quilts, as well as to their ideations of the personal, the political, and the links between them. The Houldsworth exhibition was in essence a small-scale retrospective, a concept that might have been more fully articulated with the addition of examples of Ringgold’s three-dimensional works from the 1970s. These masks, dolls, and other soft sculptures were among her initial experiments using fiber as an expressive medium; presaging the story quilts, they mark her transition from paint on canvas to the varied possibilities of collage and mixed media. For viewers unfamiliar with Ringgold’s work, the inclusion of several sculptural pieces from this period might have given a clearer sense of her career trajectory without overcrowding the gallery space. This is, however, a minor point that in no way detracts from the overall success of the exhibition. Following the closing of the Houldsworth Gallery exhibition, Ringgold’s work was again on view in London at the National Portrait Gallery exhibition Michael Jackson: On the Wall (August 29–October 21, 2018), which traces Jackson’s legacy in contemporary art. The advance publicity for it featured Ringgold’s name—and images of Who’s Bad?, her 1988 story quilt dedicated to Jackson—along with those of fellow exhibitors Kehinde Wiley, Keith Haring, and Andy Warhol, among others. Her inclusion in this abbreviated Who’s Who of recent and contemporary American art reconfirms Ringgold’s national status and also indicates, as did the Houldsworth Paintings and Story Quilts exhibition, growing international recognition of a venerable body of work rooted in American history, culture, and experience but global in its scope, sources, and appeal. Cite this article: Debra Hanson, review of Faith Ringgold: Paintings and Story Quilts, 1964–2017, Poppy Houldsworth Gallery, Panorama: Journal of the Association of Historians of American Art 4, no. 2 (Fall 2018), https://doi.org/10.24926/24716839.1678.